Mike McCormack is a U.S. Army veteran and feature writer and former editor of the Hibernian Digest, former columnist for the Irish Echo and occasional feature writer for the Arizona Desert Shamrock, San Francisco Gael, Florida Irish American, as well as St Patrick’s Monthly and Ireland’s Eye magazines in Ireland. 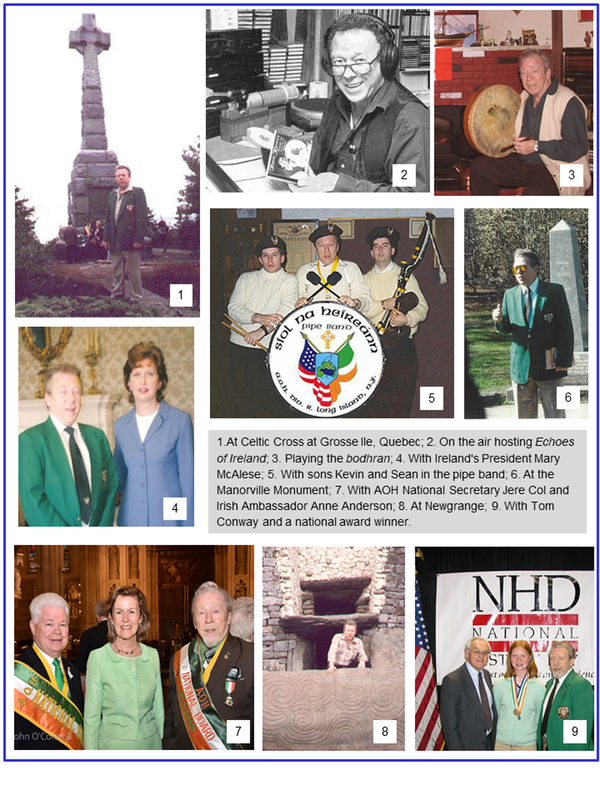 He helped organize a Division of the Ancient Order of Hibernians (AOH) in 1967 and served as its Secretary, Vice President, and President before his knowledge of Irish history earned him the post of Division Historian. He won the AOH National Essay Competition in 1978, 79, and 80, and became the first ever to win the bronze, silver, and gold National Awards in three consecutive years. He was elected Suffolk County Vice President and soon settled into the office of County Historian. He was elected to the AOH New York State Board as Director for Long Island in 1982, and by 1984 was State Historian. He continued to succeed himself in all three offices, when in 1988, he was appointed to the National Board and was soon made National Historian, becoming only the second person ever to concurrently hold the same office at all four levels of the Order. Seeking a forum for Ireland’s musical heritage, he began hosting Echoes of Ireland, a weekly radio program over WLIM in Patchogue in 1983; the following year WLIM was rated number one in the County in that time slot; he was also featured in AIRPLAY magazine and on several TV documentaries on Irish themes. He then moved to Long Island’s number one station WALK. After 21 years on the air, illness forced him to retire. He has written three songs which have been recorded by top artists. He also plays the bodhran, a traditional Irish drum, and performed on a St. Patrick's Day program at Carnegie Hall along with the Chieftains and Richard Harris. He can be heard on the CD Tappin’ the Boots by John Corr as well as Musical Echoes of Irish History with Noel Kingston. He can also be seen on the DVD The Bard and the Busker with John Corr and on The Reasons for Learning, a DVD he produced on Ireland's Great Hunger. In 1986, he wrote and directed a two-act musical pageant, Emigrant Immigrant, which starred 23 top Irish musicians, dancers, singers, and actors. It played in New York's Town Hall and was recorded on video. He served as MC for Irish festivals, concerts, and weekends at such world-famous resorts as Browns Hotel, The Pines, The Concord Hotel, The Villa Roma, Kutcher's Country Club, and the Raleigh Hotel. He worked with political officials to obtain historic landmark status for the former Manorville home of the Irish patriot, Tom Clarke and was the prime mover behind erecting a Wicklow Granite monument, carved in Ireland, at the site. He also publicized the New Suffolk test site of the first U.S. Submarine, Holland I, invented by Irish-born John Holland, and spear-headed a nationwide fundraiser to put Holland's original submarines on proper museum display. He recently served on a committee that erected a centennial memorial to the men and women of the Easter Rising. The demand for copies of his radio narratives led him to publish a 3-volume collection entitled Echoes of Irish History, followed by a book of poetry, 8 booklets, 3 CDs, 2 DVDs and two books all on his favorite topic. All are available on his site. He assisted in the preparation of a set of history panels explaining Ireland’s Great Hunger of 1845-50 for the international tour of the Jeanie Johnston, a full-scale replica of an 1848 three-masted barque that carried Irish Immigrants to America. He is a member of the N.Y. Irish History Roundtable, and holds honorary membership in the Suffolk Police and Suffolk Firefighters Emerald Societies and was elected their Man of the Year in 1988. He was also Aide to the Grand Marshal in the New York City St. Patrick's Day Parade (1972) and Grand Marshal of the St Patrick’s Parades in Ronkonkoma (1996), Glen Cove (1998), Port St. Lucie, FL (1999), Patchogue (2002) and Aide to the Grand Marshal in the New York City Parade.. He was part of the bicentennial commemoration of the 1798 Rising in Ireland, and while there, was privileged to speak at the grave of Wolfe Tone and at the Commodore Barry Memorial in Wexford. He was also part of a group of AOH National Officers who were hosted by the National Museum of Ireland, the Irish National Library, the Commanding General of the Irish Army, the Commander of the Irish Air Corps and the President of Ireland, Mary McAleese, at Aras an Uachtarain (the Irish White House). He was also awarded the Washington D.C. Friends of Ireland Award. Most recently he was given the honor of speaking at the grave of the Patriots at Arbour Hill on the opening day of the 3-day Centennial Commemoration of the Easter Rising in Dublin in 2016.